If you haven’t heard yet, it’s time to jump for joy! The first outdoor farmers market is this coming Saturday morning. Furthermore, we’ll have a bevy of your favorite greens and roots fresh for your flavorful pleasure. 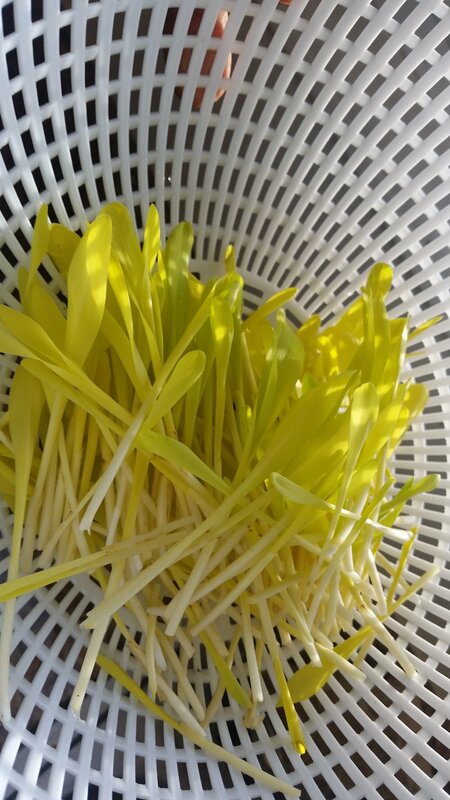 And we’re even working on a few new varieties: ever tried popcorn shoots? How about white icicle radishes? The first spring market coincides with the Earth Day Roanoke celebration right around the corner, so you know it’ll be a party! popcorn shoots are surprisingly sweet! But if you look at the title of this here blog, you’ll see I’ve buried the lead. We got a smoothie bike! And it’s exactly what it sounds like: a bicycle that turns the blade in a blender when the pedals are pushed. It only takes a 20 second sprint to turn frozen chunks to healthy, slurpy goodness. Our pedal powered smoothie machine is the fruition of a three-piece partnership. Michael Struble is a local bike racer who is gearing up for an epic 11,000 mile ride for the Bike the US for MS charity in 2020. He’s provided the “fender blender” setup this year, and we hope you as the customer may be willing to donate $1 to his ride by pedaling your own drink! Our other partner is the Little Green Hive, Roanoke’s favorite coffee and smoothie shop. We’ll be using some of the ‘Hive’s smoothie recipes, cups, and compostable straws to serve up the deliciousness. Garden Variety Harvests is providing the market booth in this arrangement, complete with dish and hand washing facility. When available, we’ll provide leafy and microgreens as add-ins to the drinks. And we hope to buy some of our ingredients for seasonal smoothie recipes from other market vendors. It’s our hope that this new food production vehicle not only provides some healthy breakfast options in the market, but also some excitement. What’s better than the instant gratification of burning a few calories to blend a few more?! We’ll bring the bike to the market on ten select days in the season to coincide with special events and sweltering Saturdays. Come to the Grandin Village Farmers Market this Saturday, April 20 to claim your prize! I’ll reach out to the winners directly on Instagram on Friday afternoon to give the secret code word. Come on out Saturday morning and celebrate the start of a new farmers market season!